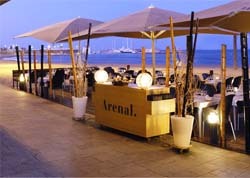 The Restaurante Arenal is a Spanish restaurant in Barcelona that specialises in Mediterranean cuisine, which is most appropriate seen as the restaurant itself is located right on the edge of the Barcelona coast, looking out over the Mediterranean Sea. The Restaurante Arenal is located right next to the beach which gives the restaurant a privileged position. Not only are the views of the sea fantastic, but the restaurant has its own natural soundtrack in the crashing of the waves and the sea breeze. To make good use of its location, the restaurant has one wall which is completely made of glass, from floor to ceiling. The interior is therefore flooded with natural light, making a bright and welcoming space to enjoy some fine food. To keep the light bouncing around the room, the restaurant is painted in white which is contrasted with black furniture and some black light fittings. The use of mirrors too helps to maintain the glowing atmosphere in the restaurant and allow the customers, no matter where they are sat, to experience the fantastic views of the sea. At night, soft lighting is used to create a smooth, chic feeling in the room. The rest of the walls of the interior at the Restaurante Arenal are covered in old photos that pay homage to the maritime history of the city of Barcelona. There are many photos depicting the old fishing boats and ports that were used in the past. However, the real star of the Restaurante Arenal is the restaurant's terrace outside. This terrace is set on a wooden decking which sits right on the beach itself with only the rest of the sand separating you from the waves. This is where the restaurant also gets its name - 'arenal', which anyone taking Spanish classes in Spain should know, means 'a sandy area'. At night, the terrace is lit up with softly lit lanterns that provide an almost magical atmosphere which is best enjoyed with a glass of Spanish wine! One of the other highlights to be found at the Restaurante Arenal in Barcelona is the classes which are sometimes held at the restaurant. These classes often focus on how to mix a good cocktail or wine and cava tasting. 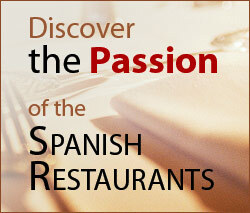 Why not pick up a skill or some dinner party trivia while enjoying a meal at this Spanish restaurant! The kitchen team is composed of young and exciting chefs who deliver a professional and efficient service as well as great food. The cuisine at the Restaurante Arenal is based on Mediterranean dishes and focuses its attention on the best quality and freshest produce from both land and sea. 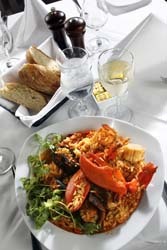 They also like to combine tradition with innovation in order to produce the best dishes possible. In particular, this Spanish restaurant believes its specialities to be in traditional rice dishes, fish, meat and Spanish tapas. They unite these dishes with an excellent collection of wines and desserts which should round add to the overall effect of the gastronomic experience. The main menu at the Restaurante Arenal in Barcelona is extremely varied and includes such dishes as 'Atún escabechado al vinagre de Jerez' (Marinated tuna in Jerez vinagre), 'Cigalas a la plancha' (Grilled Crayfish), and 'Paella de bogavante' (Lobster Paella). Aside from the main menu, the restaurant also offers a selection of set menus for groups which they hope will appeal to all tastes, all occasions and most wallets! They even offer a special menu for people celebrating a birthday at the restaurant. The tapas menu also contains some traditional Spanish dishes which are great to share between friends and family. Some of the highlights of this menu include the 'Gambas al ajillo' (garlic fried prawns), 'Calamares a la andaluza' (Andalusian style squid rings), and 'Almejas al vino blanco' (Clams in white wine).